In biology, producers are the organisms that exist and grow using photosynthesis to convert the sun's energy into food. In other words, the producers are the green plants. Other organisms within an ecosystem, the consumers, get their energy by eating producers. As on land, aquatic ecosystems have their own producers that help maintain the balance of life. Kelp, an aquatic plant, is a major producer in oceans and seas. Kelp grows abundantly in large kelp forests found throughout the ocean. They stay anchored to the ocean floor with a structure called a holdfast. Air-filled sacs called air bladders buoy the kelp up towards the ocean's surface where the plant's leaf-like blades collect sunlight for photosynthesis. 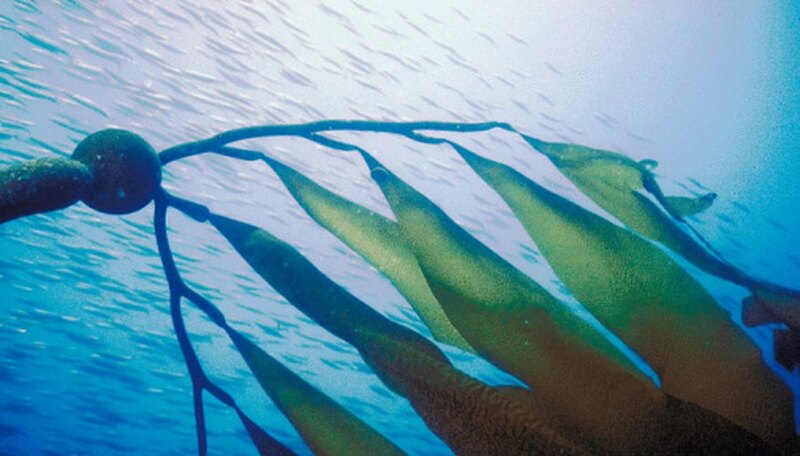 Kelp provides food and shelter for a variety of ocean creatures, such as sea turtles, crabs and various kinds of fish. In oceans, lakes and slow-moving streams, phytoplankton are the major producers. Phytoplankton are simply microscopic floating plants. Fish and other aquatic animals eat the phytoplankton as it floats through the water. A type of algae called benthic algae can also be found abundantly in lakes and slow-moving streams. Benthic means that this algae lives close to and on the lower levels of a body of water (riverbeds and lakebeds). Since algae has no roots, it usually floats or attaches itself to rocks. Benthic algae also lives in coral reefs, where the energy it produces feeds the coral it lives in. Cyanobacteria also falls into the producer category. The prefix “cyan” means blue, so this bacteria is also known as blue-green algae. Mosses and Lichens make their home in small to medium-sized lakes and streams. Moss is a type of plant that doesn't flower or grow roots. Lichen is actually a group of small plants closely related to algae and fungi. Moss and lichen grow on land but can also be found in shallow waters. Ameh, Tiffany. "The Major Producers Found in Aquatic Ecosystems." Sciencing, https://sciencing.com/major-producers-found-aquatic-ecosystems-8320654.html. 24 April 2017.